Problem #1: Your energetic money bucket is full of holes. The first reason that you’re not creating or keeping the kind of money that you desire and is because you probably have a lot of energetic leaks and money leaks you’re not aware of. When you act in ways that cause energetic misalignments in yourself, your money bucket ends up being more like a sieve so you can’t hold any of the money that comes in. One of the most pervasive energetic money leaks is cheating on your taxes by underreporting your income. For example, if you’re in business for yourself, do you take more deductions than are warranted? Let’s say you work from home and regularly take a home office deduction. Have you ever claimed an office space that was twice as big as your real home office, thinking, “Oh well, everybody does it and I won’t get caught”? That is an energetic leak because it violates your self-integrity. Even when you get away with taking an extra large deduction, there’s always the fear in the back of your mind that you’ll get caught and that’s a big energy drain. Small energy leaks quickly add up to have real, negative consequences on your ability to attract and receive money (which is just another form of energy). Another example of where people leak energy and money is by ignoring their bills. You know what I’m talking about: That giant stack of unopened bills still sitting on your desk or kitchen counter or stashed away in a bottom drawer because you’re thinking, “I don’t have the money to pay the bills” or simply “I don’t like paying my bills.” Here’s a another, more empowering way to think about bill paying: bless the fact that you have the money to pay them. And if you don’t have the money to pay all your bills, then bless the money you do have, the electricity that’s still on in your house and that money will be coming to you that will allow you to pay the bills. I want to share with you one last example of a common way people leak energy is committing to things that you actually don’t want to commit to. A perfect example is if you have kids. There are a zillion school volunteer opportunities, like being classroom mom, working on a play, or coaching the soccer team. Parents get asked to participate in these school activities, but don’t really want to do it. If you say yes out of a feeling of guilt or obligation, you’re setting up an energetic leak for yourself because now you’ve just committed to something you resent spending your time doing. If you do want to say yes to something, then say yes to it because it lights you up, fills your heart with joy and you’re excited about it. But if you don’t, then say no in integrity, so that not only are you not extending your energy to somebody or a situation to which you’re really not committed, but that you are giving the other person the chance to find somebody who is excited and fully committed. Think about that. This is a total reframe on the whole saying “yes to things out of guilt” scenario, whether it’s helping a friend or participating in the school play, and it’s very freeing. So, what do you do about these energetic and money leaks? You plug them. You fix them. You seal them up by correcting the situation. Let’s say you’ve committed to being a classroom mom and you didn’t really want to do that. Find a way to de-commit or get in energetic alignment with your commitment. It may be that you find somebody else to replace you. Or you bring your energy into alignment and really come from a place of service, generosity and contribution in being the classroom mom. You need to do one or the other or you will continue to leak energy around the situation, which will affect not just that one thing in your life but all areas of your life (including money). Problem #2: You’re not taking aligned action. When you’re an entrepreneur, no matter what kind of amazing spiritual or energetic work you do around manifesting your desire, if you don’t take aligned action, you’re not doing your part to bridge the gap between the energy of money and bringing it into your reality on the physical plane. Given your current situation, the business that you’re in, and the things that you want to accomplish with your life and business, what is one aligned action that you have been putting off? It might be creating a program. It might be getting your marketing strategy developed so you’re not always trying to do things last minute and just posting any old thing up on social media. Feel like you don’t know what your next right aligned action is? The thing is, deep down you do you know what it is… and it’s probably the thing that you feel a lot of resistance around. Your next right aligned action is the thing where you’re like, “Oh please, I don’t want to have to call people! I don’t want to be on Facebook Live! I don’t want to write this guest post or be a speaker at an event… because it scares me.” That is the very thing that will help you create the money you want. Problem #3: You’re not trying to succeed. You’re trying not to fail. There are a lot of entrepreneurs in all kinds of fields who are “trying” to succeed. That’s what they say: “I’m trying. I’m doing everything I can. I’m really trying hard.” The problem is that deep down, they don’t truly believe they can succeed. They’re not trying to succeed; they’re trying not to fail. Do you see the difference? There’s a massive mindset and energetic difference between “trying to succeed” and “trying not to fail”. This difference profoundly influences your ability to create money, attract clients and create abundance in your life. If you’re approaching whatever it is that you’re doing from an energy and a standpoint of “I’m trying not to fail,” that is a very different energy than an energy of “I am going to succeed. I’ll keep at it and I know I my efforts will pay off.” If you’re trying not to fail, then you’ll have a really hard time growing your business and being successful because you’re constantly focusing your energy on avoiding failure instead of doing the things you need to do to succeed. Problem #4: You’re over-complicating things. At the heart of it, being a successful online entrepreneur isn’t complicated. Getting clients is not complicated. It is as simple as reaching out to somebody, inviting them to work with you, having a conversation and then being unattached to whether they say yes or no. With the right offer that connects with your ideal clients and the right energy during the conversation, when you consistently ask enough people, you will hear enough yeses to create the kind of money you want. Where people get tripped up is that they overcomplicate things. 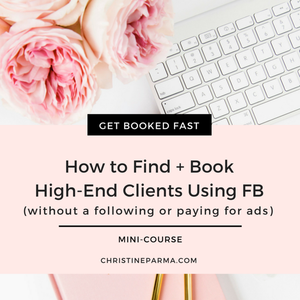 They add on all the fancy new strategies and feel like they must have all the tech bells and whistles in order to book clients. Although tech and automation can certainly help you reach more people, the tools don’t make the sale. You do... with your offers, energy and authentically showing up in your marketing. People often hide behind technology, busywork or the “need” to implement complicated business-building strategies when they don’t feel confident about sharing their work or asking for the sale. I get it. Having conversations with people and inviting them to work with you risks you getting rejected. It feels safer hanging out behind the buffer of “anonymous” marketing strategies like Facebook ads that promise to get you clients without you having to talk to anyone. And then if you still don’t get clients, you can blame the ads and not feel like you failed. If you’re new in business and you’re not clear on what your message is, you don’t have a compelling core offer, you can’t explain what how you help people in under 30 seconds, you don’t really know the struggles and hopes of your ideal clients, you don’t know your pricing, and you don’t have rock-solid confidence in the value you provide, and a defined path for how the ads will help you put money in your bank account, Facebook ads and any other complicated marketing strategies are not going to work for you. Sorry, but it’s the truth. You’re going to see little return for all your time, money and frustration. The bottom line is that you need to have a lot of foundational pieces in place before you start complicating your business with tools and strategies you really don’t need to be successful. Do an audit on yourself: Where are you unnecessarily overcomplicating things in your business or even in your life? Are those things truly necessary? What would you stop doing if you didn’t feel like you had to do it in order to get clients or make sales? Problem #5: You’re not taking advantage of the opportunities all around you to create the money you desire. I’m going to give you a really perfect example. There are an infinite number of opportunities around all of us all the time to create more money and more of everything we want. You probably have an intuition about which opportunities are the right next moves for you. When a certain thing keeps showing up in your life over and over again, it’s a sure sign to pay attention. But here’s the tricky part: you need to pay attention from a place of non-judgment. We all tend to believe that getting that thing we want, like creating more money, has to happen in a certain way and we tend to dismiss opportunities that fall outside of that box because they look different than you wanted or expected them to. That way of thinking severely limits your ability to create the money you deserve (or anything else, for that matter). Here’s an example from my own life. Since the middle of this year, I’ve been attracting a lot of direct marketers. They join my Facebook group, Successful Women Entrepreneurs, they join my online challenges and they become my clients. I’d never been involved in any kind of direct marketing and I was like, “Why am I attracting all of these direct marketers? I don’t understand.” Typically the people I serve are coaches, healers, and transformation facilitators. But all of a sudden, tons of direct marketers are showing up in my world. Then, just recently the opportunity to meet a personal money goal I’ve set for myself came up… but it didn’t look at all like I thought it would. This is an opportunity that gives me what I want but it’s via direct marketing, which I hadn’t ever been particularly drawn to. And so I had to really think about it and ask myself, “ Am I going to pass up this opportunity to get what I want simply because it’s coming to me in a way that I didn’t expect?” If you’re not creating the kind of money and business results that you want, you need to look at where you might be letting your judgements and unsupportive beliefs get in the way of you seeing all the amazing opportunities to create what you want that are already all around you. After checking in with the vision I have for my business and life, I said yes to that opportunity and am integrating dōTERRA into my business model. I’ll be using the essential oils to not only support my own family’s health but also be integrating them into my work to support my clients in creating energetic alignment with their money and business goals in order to reach them faster and with greater ease. So often when something isn’t working in our businesses or lives in general, we try to do more, work harder and pile on new strategies in attempt to fix the problem. When you’ve tried just about every practical strategy under the sun to create the money you deserve and it hasn’t worked, it’s time to consider that the problem isn’t always just “out there”. And what’s called for is a combination of smart business strategies and supportive mindset principles to finally cure the not-so-obvious causes of your business and money troubles. That’s exactly what I help my clients do. Where have you unconsciously been leaking energy and money? What opportunity keeps showing up that you haven’t taken advantage of? What steps will you be taking to create the money you deserve this next year? 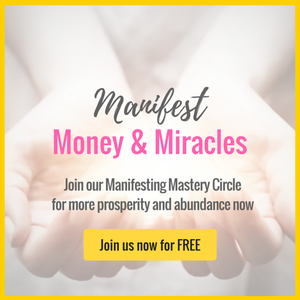 Ready to finally create the money you desire and deserve? Join me for the LIVE round of Passion, Launch, Profits! starting January 8th! Snag special bonuses when you sign up now! Get the details here. Rapidly grow your online business and crush your income goals in the next 30 days! Click here.